Michael Boudreau, 62 of Worcester, MA passed away on January 19, 2019 at home. He was born in Southbridge on January 3, 1957 , son of Henry and Rose (LePage) Boudreau. He is survived by his sisters, Theresa and her husband Bernard Beauregard and Donna and her husband Errol Green of Westwood. He also leaves several nieces and nephews and grand-nieces and grand nephews. Besides his parents, he was predeceased by 2 sister, Carol in 1948 and Jeanne Moran in 1997. A a longtime supporter, programmer-DJ at WCUW-FM Community Radio, Michael presented a broad spectrum of creative music, from down home Blues to Avante Jazz. 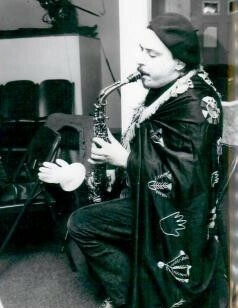 He was behind the presentation of several concerts, bringing prominent artists in these genres to the Worcester area along with being a contributor to the WPI Jazz Database. As part of his support for the arts, both musical and visual, he was a member of the Worcester Artists Group, co-curating the Abbatoir gallery at W.A.G. He also performed as a member of the Forbidden Poets, blending music and poetry. Mike was known in the arts community as a master chef blending his own curries and creating many original and classic meals. His culinary skills reflected cooking traditions from around the world. He was a true independent and creative individual. Never fearing rejection, his candid honesty was prominently worn on his shirtsleave.